Feeling the spring break blues? It’s rough coming down from that relaxation high, but just around the corner, a music festival awaits. 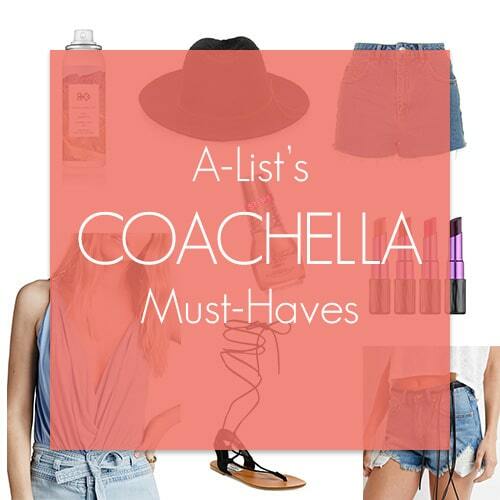 That’s right, A-Listers: Coachella is finally here! Dust off your gypsy belts, turquoise rings, and suede fringe vests for another round of swaying and praying to the music gods of the world. Music won’t be the only thing hot in Indio this weekend! Predicted to be a blazing 94 degrees, these A-List must-haves will keep you looking fresh (and hydrated!) throughout your Coachellin’. Believe me, you won’t have to be in Ibiza or be Mike Posner to make Avicii think you’re cool with these buys. Festival goers will really think you hit the mark in the ‘Bullseye’ Wrap Front Tank from Free People, available in 5 colors for every taste. It’ll keep you cool, leave room for a great tan, and shows just enough skin. Pair it with these high waisted MOTO Vintage Mom Shorts from TopShop to get that slightly retro, but still bohemian, classic Coachella look. The palette may seem basic, but we all know Coachella style is about how you accessorize! So what’s super classically Coachella? Metallic flash tattoos! Subtly show off your house spirit in A-List’s sorority friendly, festival centric flash tats. Not to be outshone, trendsetters at Instyle Magazine predicted metallic nail polish will be making an out-of-season appearance at the festival. We recommend checking out our girl, Kylie Jenner’s, new nail polish line for fun and sparkly shades. Contrast it with another InStyle prediction: dark lips. Swipe on this broodingly glamorous color from Urban Decay and pout for the camera! Don’t forget to keep your mane looking luscious under that hat throughout the weekend. Tried and true by our A-List Team, Rand+Co’s Death Valley Dry Shampoo will keep your on trend curls or sleek locks looking shiny and desert chic. Last, but definitely not least, is our A-List shoe pick for this festival season. Throwing back to gladiator sandals years ago, lace-up lovelies are back in style, but this time with some boho touches. If Jeffrey Campbell gladiators and Chanel ballet flats had a baby, it would be these Steve Madden hybrids. Delicate and without hardware but with some wicked lace ups, these beauties are perfect to spice up your festival finds but can transition poolside to Vegas or Cabo. Have you found your Coachella look or have any other tips to share? Comment below! We love to hear from you! This entry was posted in Greek Jewelry, Members Only: A blog for chics and Greeks alike. and tagged Coachella, fashion, Festival, Flash Tattoos, Forever 21, Free People, Jewelry, Kylie Jenner, Music, Steve Madden, TopShop, Trends.